Set up your ECM V-Titan 64 espresso grinder. 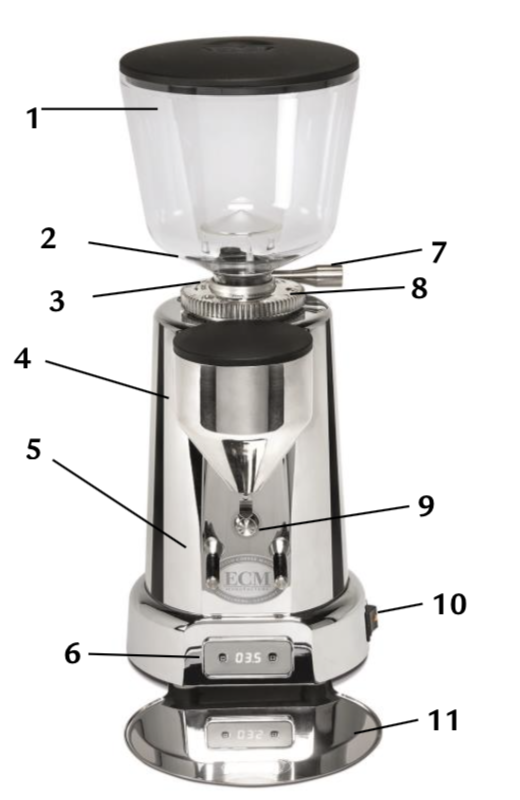 In this user manual, you should find everything you to need to operate and maintain your flat burr home espresso grinder. Please read carefully before using your ECM V-Titan. Grind adjustment on the ECM V-Titan is accomplished using the the grind adjustment knob (7) located behind the grinder's hopper. Lower numbers indicate a finer grind and higher numbers indicate a coarser grind. This grinder is infinitely adjustable, so keep in mind that the numbers are simply a reference point. Timed dosing is controlled by the small display located at the base of the grinder. To adjust one of the timed grind settings press both the plus and minus buttons at the same time. The display will then read "T1" in reference to the first timed dose setting. To edit the second timed dose setting first press the minus button. The display will then read "T2." To edit either press the plus button, then used the plus and minus buttons to alter the time of the setting. To save and exit simply wait a few seconds and the display will return to the menu. Press the minus button to cycle out of the menu and back to the home screen. The timed doses are accessed by use of the grind button (9). To use the first timed setting simply tap the grind button once. To use the second, double tap the button. To grind manually, press and hold the button. After about one second it will begin grinding. Release the button to stop.